lt;stronggt;CWNMAFG62BKlt;/stronggt;lt;BR/gt;Crown Mat-A-Dor Entrance/Antifatigue Matlt;BR/gt;Want some tips for keeping your home and office free from dirt and debris Here are 2,400 of them. That's how many shoe-cleaning rubber fingertips there are per square foot on these mats. The flexible surface also provides the comfort and qualities of an anti-fatigue mat. Beveled edges keep mat flat and reduce tripping hazard. Easy-to-clean design saves you time and energy. 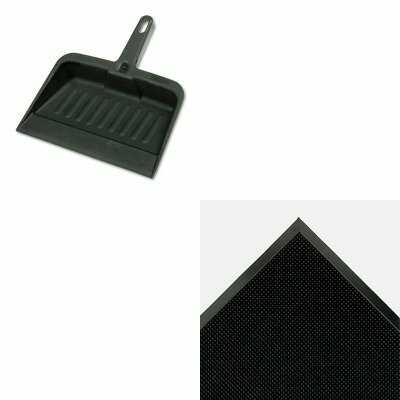 Mat Type: Anti-Fatigue Mat Application: IndoorOutdoor Materials: Rubber.lt;BR/gt;lt;BR/gt;lt;stronggt;RCP2005CHAlt;/stronggt;lt;BR/gt;Crown Mat-A-Dor Entrance/Antifatigue Matlt;BR/gt;Handy dustpan features a tapered front edge to help simplify sweeping-up. Heavy-duty, moderately flexible plastic provides commercial-grade durability. Lanyard handle-hole allows you to hang and store the pan out of the way. Material(s): Polypropylene; Width: 8 1/4quot;. ~ Includes one dustpan.